Spring Ecstasy Socks are worked toe up. Charts are provided for the budding vine cabling as well as for the heel. 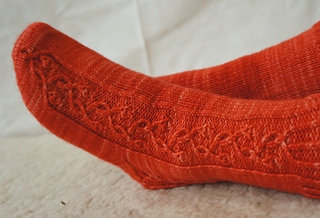 The pattern was exclusive to the Great Finnish Yarn Club from Villavyyhti until November 2014. 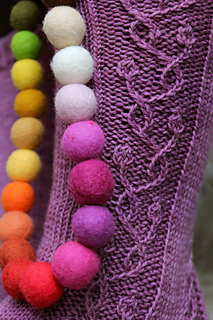 It is now available as a free Ravelry download for everyone. Nov 17, 2014: Pattern in Estonian now available as a free Ravelry download. Thank you Kaisukas for the translation!